Tonight Anthony Crolla (23-2 9KO) will put his British Lightweight belt on the line in his fight with Derry Matthews (29-6 15KO) at the Sports Centre in Oldham. For Crolla, a win will give him the opportunity to fight for a European or even a world title. For Matthews, a win will save his career. The reason I say this is because in his career so far, Derry Matthews has lost six times all by stoppage. One of those stoppage defeats came in his last fight where he looked vulnerable getting hit to the head and body. If he were to lose for the second fight in a row, particularly if he loses by stoppage, retirement would be the only option. Crolla was rumoured to be fighting for a world title against Ricky Burns, but that fight didn't come off and Crolla will want to look impressive in this fight to increase his chances of a world title fight. 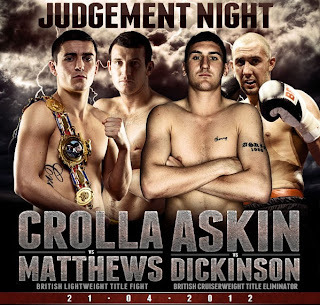 On the under-card, Matty Askin will fight Jon Lewis Dickinson for the British Cruiserweight title in a contest scheduled for ten rounds. Both the main event and co-main event should be exciting bouts, but who will come out on top on a fight card billed as 'Judgement Night'?